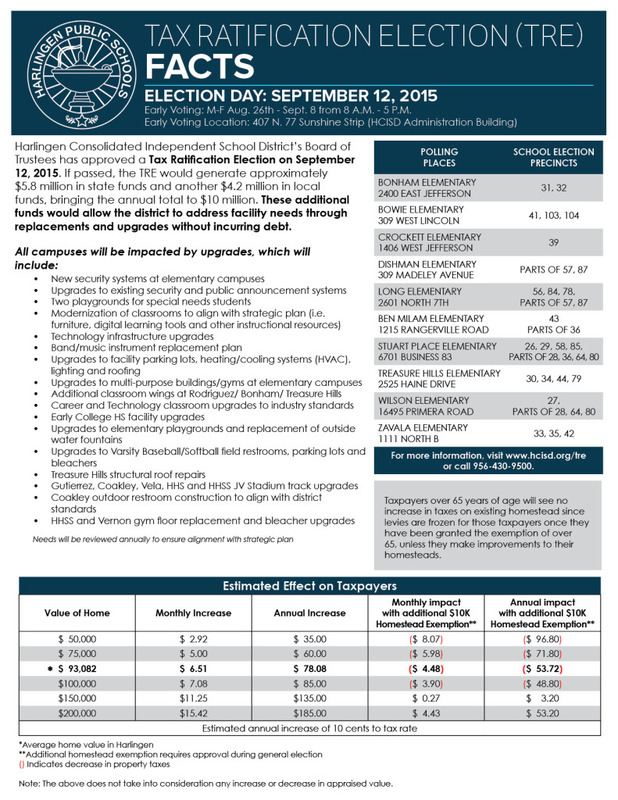 On July 14, 2015, the Harlingen Consolidated Independent School District Board of Trustees approved to hold a Tax Ratification Election or TRE on September 12, 2015 during their regular board meeting. The TRE will give Harlingen voters the opportunity to vote on a proposed adjustment to the tax rates that fund their schools. If approved, the tax ratification would allow HCISD to access the maximum amount of state funds for the replacement and upgrades of facilities and equipment throughout the district. The proposed tax rate adjustment is an increase to the M&O and a decrease to the Interest and Sinking rate or I&S. The M&O funds the maintenance and operations of schools, and the I&S pays for any bond debt that may have been issued to fund the construction of schools and facilities. If the proposed rate is adopted, the M&O tax rate will be $1.17 and the I&S rate will be $.148 for a total tax rate of $1.318. In May, HCISD saved over $8 million by refinancing a portion of their long-term school bonds, which resulted in an estimated decrease of $.3 in the I&S fund. In return, the district has the opportunity to redirect these savings to the M&O through a TRE. The TRE impact to homeowners is determined by three factors: state matching funds, recent bond savings, and a pending increase to the homestead exemption amendment. In the general election, voters will also have a chance to further reduce their property taxes when a constitutional amendment is up for election. If passed, this amendment will increase the homestead exemption from $15,000 to $25,000, thus reducing the taxable property value to the homeowner. The increase would be $.10 for every $100 in property taxable value. For a homeowner whose house is valued at $93,260, the average home value in Harlingen, this equates to an increase of $6.51/month or $77.08/year. If the homestead exemption is passed the average homeowner will see a savings of $53.72/year. Twenty-two school districts in Region One have approved a TRE and have been accessing these additional state funds as early as 2006. For more information or to find your polling location, please visit www.hcisd.org/tre or call 956-430-9500.